Well our Trilogy exhibition has well n truly come to an end and it's time to reflect on new works and new directions. We were honoured to have John Ogden as our guest speaker & to officially open our show. Many turned up to see the art of Mignon Parker and myself and It was a colourful collective of still lives and portrait works. The Warringah Creative Space gallery is a lovely building made from recycled materials, a super space to showcase your works. Now we've packed it all away its time to imagine all the new paintings to be bought to life. Thanks to one and all who came along and made it such a great night. Heres a few photos from the opening night. 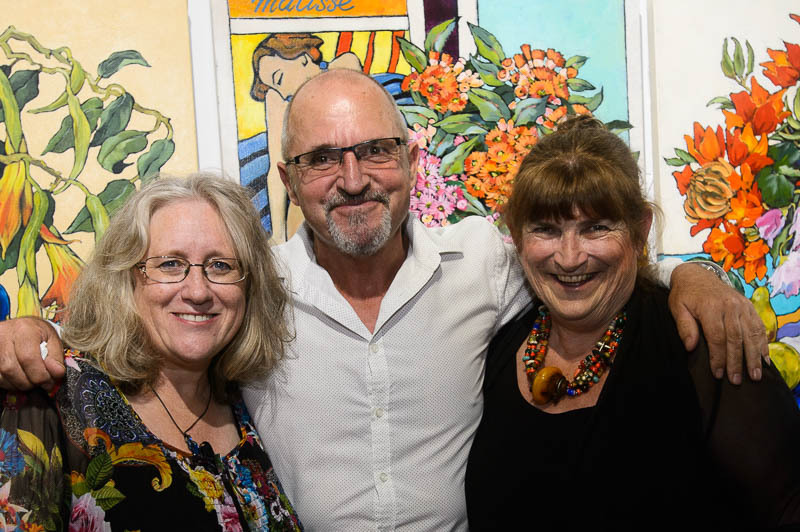 John Ogden, Stephanie Galloway Brown & Tania Niwa at the Trilogy Exhibition. Thanks to Tania Niwa Photographer for this great pic. Kathrin Longhurst & Stephanie Galloway Brown at Trilogy Exhibition. Thanks to Michael Mannington for the image. Stephanie Galloway Brown, John ogden & Mignon Parker at Trilogy Exhibition opening night. Image courtesy of Michael Mannington. Tania Niwa. Photo by Michael Mannington.